The centenary of Beethoven’s death stimulated record companies to produce a large swathe of new discs. English Columbia was particularly effective in this regard, issuing a complete symphonic set and adding prestigious chamber works to the catalogue. But Grammophon in Germany was assiduous too, albeit slower. Hans Pfitzner, Richard Strauss, Erich Kleiber and Oscar Fried were conductors chosen to direct the symphonic repertoire, a project that, contrary to expected norms of German efficiency, was delayed until the Weimar Republic was on its last legs. Naxos has issued them all and I’ve reviewed a number of them. 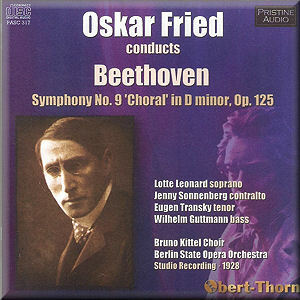 One that escaped me then, but not now, is Fried’s recording of the Ninth. Its Naxos incarnation was 8.110929, but it was also issued on LYS279 and, under the counter as it were, on Iron Needle 1395. I’ve only recently reviewed a very slightly earlier Albert Coates recording of the Ninth – his second, as he was entrusted with a late acoustic version as well. The differences between the volatile, incendiary Coates and the linear, direct, unflamboyant Fried are significant. But I found both performances worked well on their own expressive levels, and good transfers enhance the experience. Mark Obert-Thorn has retained a relatively high level of surface noise on the French Polydors used, the better to allow a good frequency response. This allows one to hear how carefully balanced are some passages. It also reveals moments of sectional untidiness in a few brief places that are not, from the timings, due to nervousness at side changes but perhaps more down to Fried not quite getting things together at those points. They are, I should add, insignificant in the great scheme of things. Fried was a rhythmically precise conductor though his employment of strategic rubati for expressive reasons is exceptionally well judged. He starts with a good underlying pulse, and delivers a first movement that is logical, coherent and impressive. His Scherzo is full of strong accents, dynamic drive. I sensed the turn over in this movement at 4:50. Orchestrally speaking the Berlin State sported some highly accomplished brass players and personable, recognisable wind players too. This adds to the colouristic possibilities open to Fried and he takes advantage of them to notable effect. The Adagio has no idiosyncrasies; there are no lurching accelerandi, and no obviously personalised devices that may seem rhythmically obstructive. I assume that the rallentando at 5:01 is a preparation for the side change, as it doesn’t sound structural within the context of the movement as a whole. In the finale we can admire the deep tangy power of the double basses and cellos, and they offer really hefty, ‘bottom-up’ German string tone at its best. Once again the finale is tautly controlled, and as befits the conductor who had undertaken a massive, late acoustic 1924 recording of Mahler’s Second Symphony, large forces didn’t daunt him at all. The soloists may not register much as names now, but they did then, and they are all outstanding. Kittel’s choir was probably Germany’s best at the time. This extremely fine restoration presents an important document from a distinguished Beethovenian.